Are you a food blogger and are interested in increasing traffic to your site? You need to consider investing in Tailwind, a platform that helps to easily automate and grow your referral traffic from Pinterest. 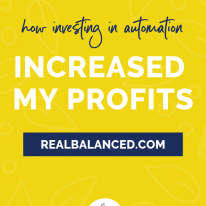 Previously, I have shared how automation is key to being a successful food blogger. I firmly believe that the more facets of your business can run without you actively checking on them on a daily basis, the less your stress level will be AND the more income you can make, especially when it comes to sharing the content that you have worked so hard to create. One of the main ways that my team and I automate the sharing of my content is through Pinterest, and we do this by using a platform called Tailwind. Using Tailwind for Pinterest has been INCREDIBLE and has made our lives so much easier and has led to increased traffic and, therefore, increase revenue for Real Balanced. Tailwind saves my team time and has allowed us to truly improve (and automate! ?) my online presence. Remember that you should be only creating new content 20% of the time. The other 80% of your time should be dedicated to sharing it. I know it’s easy to fall into the trap of always need to make more, more, MORE, but it’s just not the case. I personally know this because even when we have lessened our output of new content, neither my traffic nor my ad revenue has decreased. 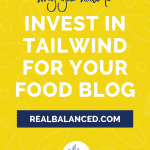 There are a number of reasons why you should incorporate Tailwind into your food blog. 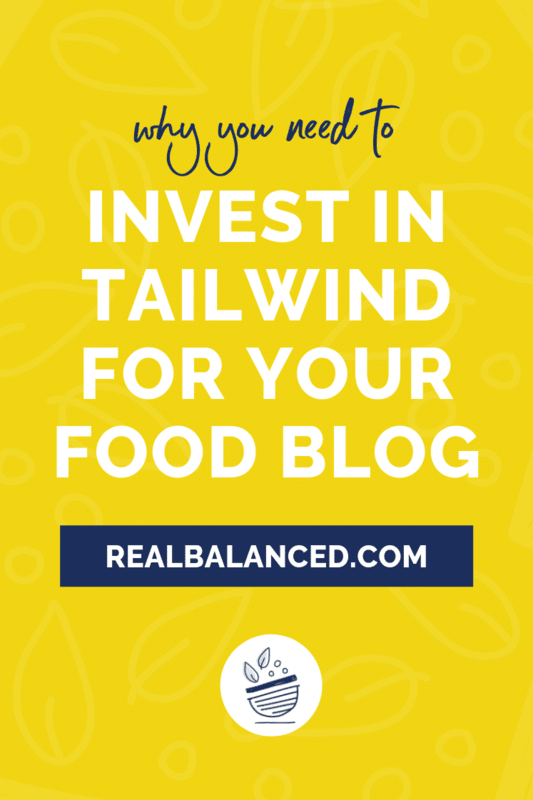 From easy scheduling and post looping, to analytics and online communities, there are multiple reasons why I believe you NEED to invest in Tailwind for your food blog. If you’re wondering what is Tailwind, this cheat sheet is for you! 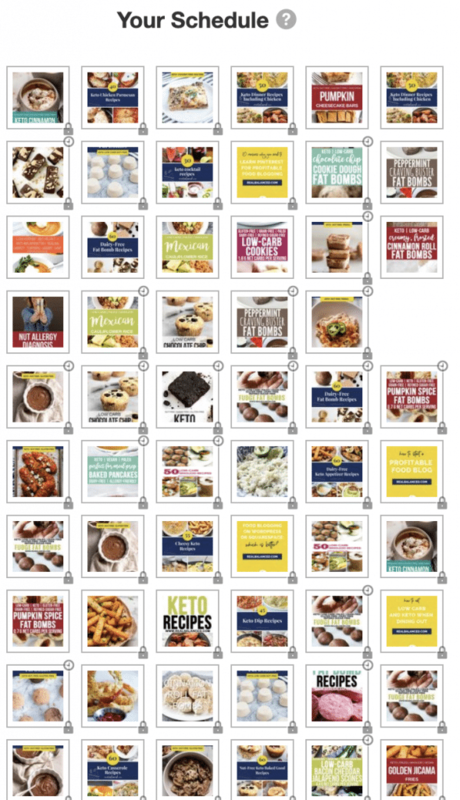 Download this cheat sheet so you can easily reference all of the ways you can effectively implement Tailwind for your profitable food blog! If you’re new to Pinterest (or if you’re new altogether to food blogging), you may be wondering why you even need to automate your Pinterest account. At first, it may seem like it’s not a very time consuming task. Just pin a few times a day and you’re all set, right? Well, not entirely. 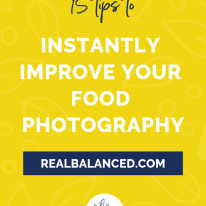 First and foremost, you need to be pinning throughout the day every single day, which will become nearly impossible the busier you get with your food blog. Plus, there will be days you either don’t have time to manually pin or you just purely don’t feel like it. Those are the days that Tailwind is essential. You need to be pinning your content and other users’ content every single day. Batch your work: You can block out a few hours one day per week solely dedicated to pinning. This is beneficial because you will be more focused and more efficient in your social sharing. I love everything about “batching” and “block scheduling.” I truly believe that you will be a better business owner if you batch your work with platforms such as Tailwind. Maximize your reach: Optimize your pinning schedule to reach the widest possible audience. Utilizing data, Tailwind offers the ability to determine the best time of day to pin for your audience. Why is this important? Instead of manually pinning 10 pins in a row when you have a free moment at 11pm on a Tuesday night, Tailwind allows you to schedule your pins throughout the day depending on when your audience is most active on Pinterest. 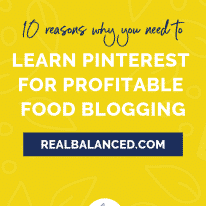 Posting at the right time of the day will lead to your followers seeing your pins, pinning them, having them re-pinned, and leading to more opportunities for vitality, which, honestly, is the ultimate goal of most food bloggers on Pinterest. A viral pin will lead to increase traffic, which will, in turn, increase ad and affiliate revenue. Pinterest account analytics: Tailwind offers amazing Pinterest analytics. Even if you don’t fully understand how to read and utilize analytics to your benefit, having this as an option is extremely important in gauging your success. Tailwind features a scheduler tool called SmartSchedule that allows us to plan our posts ahead of time. With this tool, you can sit down and take 1-2 hours to plan out Pinterest pins and when they will be scheduled to be published on your account. We can prepare them days, weeks, or even months in advance! In doing this, we don’t even have to think about my content again until it’s time to schedule new posts! In your Weekly Pinning Schedule, you can determine the amount of times per day you want to post pins to your account and Tailwind will provide time options for you that are the best times of the day to pin based on your audience’s past engagement. Once you determine how often and when you want to pin, you can start filling up your schedule with pins. Each of these pins are now scheduled to go out at a time that I have set and, automatically, when that time comes, they will be pinned to my Pinterest account. 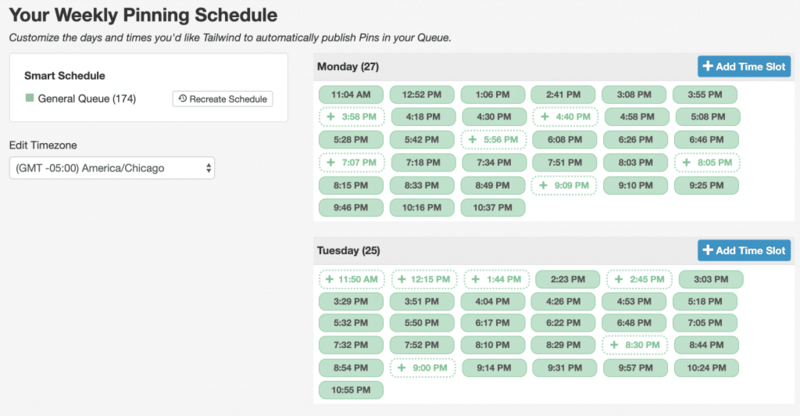 On top of allowing us to batch our Pinterest work, Tailwind SmartSchedule tells us when to schedule pins. This is really important for the Pinterest algorithm. If you pin posts when the most engagement is occurring, you will receive more involvement which will show Pinterest that your content is relevant. Because Tailwind has access to the accounts of millions (literally millions) of businesses, they have access to a LOT of data. For this reason, they know the best times to post content. Posting times are important for more than just Instagram and Facebook! Smart Scheduler is a FANTASTIC tool for this. New content shouldn’t make your “old” content less relevant. With SmartLoop, you are able to schedule your content once, and the tool will recycle it for you as time goes on. This is perfect for evergreen content (content that remains relevant over time), because it can be re-shared and viewed by more and more people each time. It allows your content to stay relevant and continuously attracts traffic to your website. Sharing seasonal content? There is a part of the SmartLoop feature that turns on and off throughout the year so that your content is only shared when it is the most relevant. SmartLoop is a fantastic tool to use, especially as you continue to garner new followers on Pinterest. It allows you share “older” content with them that they may not have gotten a chance to view previously! With Tailwind Tribes, you have access to likeminded people within your circle. You are able to share each other’s work with your respective audiences. This increases brand awareness for both parties, making it a “win-win” for everyone! You can create your own Tribe or receive invitations to join others’ tribes. Before inviting other users to your tribe or before accepting invitations from other users, be sure that their content is relevant and the details of the Tribe fit your niche. To make matters even better, Tailwind Tribes supply you with a massive quantity of relevant material right at your fingertips. It makes finding quality (and relevant) content to share with your audience SO much faster and easier. Though Pinterest provides analytics, Tailwind takes the details to an entirely new level (because, honestly, Pinterest analytics just have never really cut it for me). With Tailwind’s data, you are able to see everything from profile performance and engagement rates to board insights and virality scores (your number of re-pins divided by your number of saved pins). Taking advantage of Tailwind’s analytics is a wonderful way to gauge your progress and set goals for yourself. Additionally, you can this insight to determine which boards to focus on. If one particular board isn’t receiving much traction, you can target your focus elsewhere to make better use of your Pinterest time allotment. Tailwind’s Chrome extension makes sharing content a breeze! Once you download the Tailwind for Chrome extension, you will see the “Schedule” icon pop up on content and images throughout the web. By clicking on this button, you can easily schedule content to be shared on your Pinterest (be sure to include proper site credit). The Tailwind Chrome extension is an AWESOME way to easily add content to your boards, and I definitely recommend trying it out. Did you know that you can schedule your Instagram posts directly from Tailwind? It’s true and it’s pretty cool! More than just automating your Instagram publishing, Tailwind also provides strategy that will tell you the best time to post, will refine your publishing scheduling, and will keep you organized. According to Tailwind, you should keep content “inspiring, actionable, relevant, and search optimized.” This applies to content both new and old. Images: Always be sure to share great photography. By using eye catching, mouth watering images, you will gain more attention. As your photography improves over time, you can always swap out old pin images and update them as needed. Titles and Captions: Optimize your titles and captions to increase your reach by including SEO keywords that are useful to your blog. When someone searches those keywords, this helps your pins be seen! Links: Don’t forget to link to your website! Without a link to send readers to your blog, how are they going to know how to make your tasty dish? Be sure to include as much information on your pins as possible. Tailwind is truly SO beneficial to food blogging, and I recommend getting started with it today!